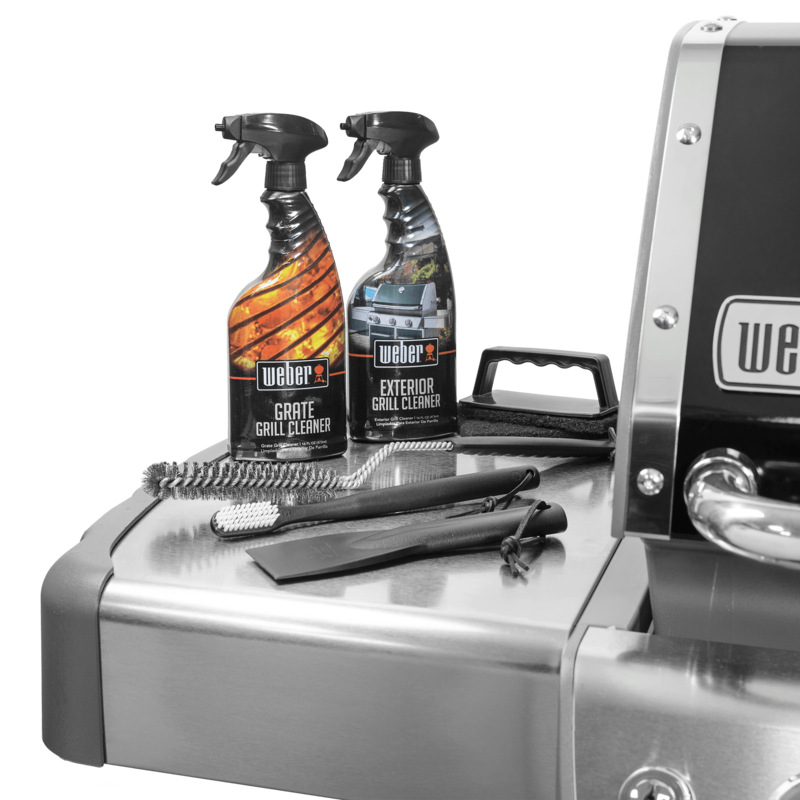 Keep your grill looking like new with the Weber Q Grill Maintenance Kit. The kit has everything you need to keep your Q grill as shiny as the day you bought it - on the inside and out. Kit includes: Grate Grill Cleaner, Grate Scrubber with five scrubbing pads, Grill Brush, Cookbox Scraper, and Stubborn Stain Remover. 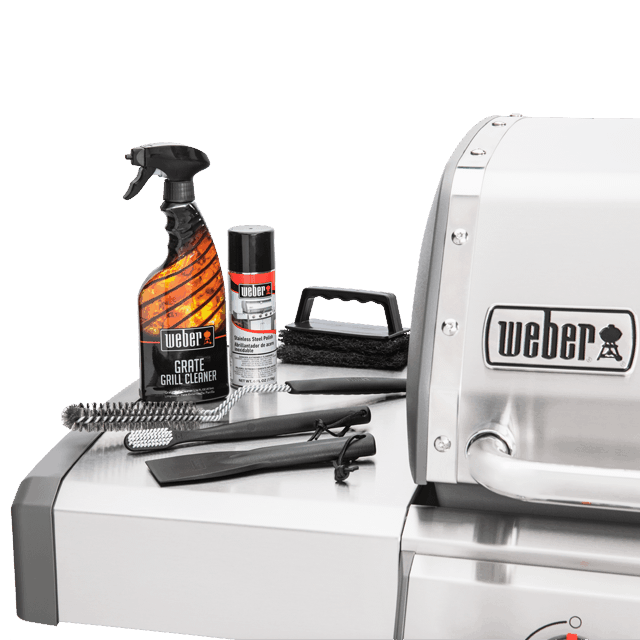 Kit includes: Weber® Grate Grill Cleaner, Grate Scrubber with five scrubbing pads, Weber® Stainless Steel Bristle Brush, Weber® Cookbox Scraper, Weber® Stubborn Stain Remover, and instruction booklet. Weber® Q Grill Maintenance Kit is rated 3.8 out of 5 by 6. Rated 2 out of 5 by Robert R from cleaning electric grill I purchased the electric Grill Q2400 and called to see if there was an easier way to clean it. right now I have to take each grill top bring it in my apt and clean it in the sink. then take the alum casing and wash that. I called to asked if there was an easier way to clean it outside. like spraying the cover inside and the grill. The only answer I got from the call directly to weber was there is a kit but still would have to clean it in the sink. This is such a task that before when I was able to have a gas grill I could clean it outside and now I don't even enjoy cooking with it. There should be a better way to clean this. Rated 5 out of 5 by Redline from Better than expected! I can't say enough about how this kit really has everything needed to keep my grill clean. I was impressed how easily my q2200 cleaned up and am definitely going to purchase a few more of these as gifts for my family members who also own q grills. Worth every penny! Rated 1 out of 5 by Blackbart01 from Not made for the electric grill This product needs to be improved for it to be useful with the electric grills. Two of the tools are not made for the surfaces, and the spray cleaner is minimally effective. The way I have had to clean the below coil removal pan and the grates is to remove them, soak them in my sink and then use the scrub pads to remove the debris.